Amazon has unveiled smarter, more attractive Echo devices. 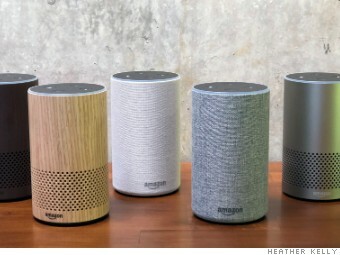 At a secretive press event held on Wednesday in downtown Seattle, the company showed off new versions of its popular Amazon Echo device. 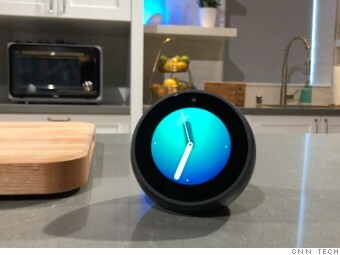 There is an updated original Echo, an Echo Plus that includes a smart home hub, and the odd little Echo Spot, which is like an alarm clock with a screen. The event was held at Amazon's "Day One" building, a 37-floor tower that opened late last year. 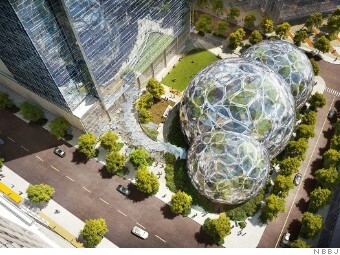 The building is part of Amazon's new campus in downtown Seattle, a $4 billion multi-building project that includes a 5-story glass dome structure for plants. The original Echo is getting a new look. The new Echo is shorter and fatter than the original -- and available in finishes including wood veneers, brushed metal and a heather grey fabric. It has some improvements inside as well. There's a new speaker that Amazon says will improve vocal and bass quality. The new far-field microphone will do a better job of blocking out background noise and hearing the "Alexa" wake word, according to the company. It will cost $100 and start shipping in October. Amazon also revealed the even Echo Plus, which doubles as a smart home hub. A tall and skinny cylinder like the original, the Plus is available in a new grey finish. Smart home devices are usually controlled through a dedicated hub. The Plus builds that in, so you can add new gadgets by saying "Alexa, discover devices." It can control lightbulbs and smart plugs and locks. It has the same updated speakers and microphones as the classic Echo. Each Echo Plus will ship with a starter bulb from Philips to get people hooked on smart home devices. It will cost $149 and be available in October. Amazon also wants Alexa to be your new alarm clock. The Echo Spot is a round Alexa-powered gadget with a touchscreen and a small camera. It's like a mini Echo Show. You can watch videos on it, get your morning briefing, or use it as a baby monitor. There's a front-facing camera if you like to make video calls from bed. The device will cost $130 and ship in December in the U.S. Existing Echo devices are also getting a features boost. You'll be able to play music on multiple Echos at once by saying requests like "Alexa, play Cardi B. everywhere." The updates are available via the cloud, so users don't have to download new software. 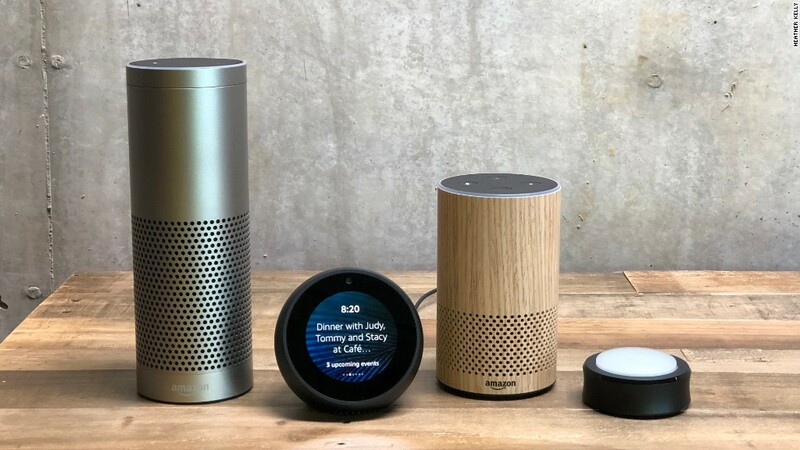 You can group commands together as "routines" so that a single command ("Alexa, good morning") can turn up the lights, start playing NPR and turn on your connected tea kettle. Or "Alexa, date time" to lower the lights and turn on Barry White. 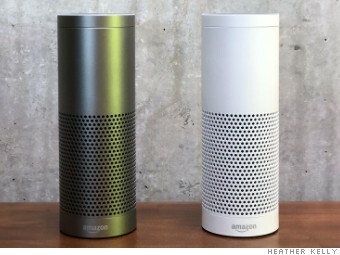 Amazon's Echo line does more than play music and spit out trivia. In fact, Amazon sees it inching toward replacing the home landline. Starting today, you'll be able to make phone calls to any numbers in the US, Mexico and Canada for free. If you want to connect your Echo to your landline, Amazon is selling a $35 black box called Amazon Connect that links the two. You can get calls at your home number and, if necessary, call 911 from an Echo. The company is also bringing the Echo's built-in voice assistant Alexa to the car so drivers can order pizza or change tunes while on the highway. It will be included in select BMW cars starting in 2018. Amazon noticed people were frequently using the Echo to play games and have fun, so it decided to make a dedicated device just for that. The new Echo Button is about two inches high with a blinking light on top. It's designed to work with social games, most likely as a buzzer. The company is working with developers such as Hasbro on games like Trivial Pursuit. Price: $20 for two Buttons. The latest version of the Fire TV is a square dongle that plugs into the back of your TV. It has HDR and 4K support, and comes with a remote that works with Alexa commands. You can also control it with any other Echo device to do things like select shows, fast forward or rewind. The Fire TV costs $70 and will be available in late October. Amazon has been busy building its new Seattle campus. The centerpiece of the headquarters is a building made of three converging domes. Called the Amazon Spheres, the 90-foot high glass and steel structures will be home to a lush botanical garden and a 60-foot "living wall" made of plants. The event came two weeks after Apple's iPhone 8 and iPhone X event held at its new Cupertino headquarters. Amazon launched its Echo smart speaker in 2014. That device started a race among major tech companies to create their own versions of the surprise hit. Google created the Google Home, Apple is releasing the Home Pod later this year, and Microsoft is working with third-parties on speakers that use Cortana. Meanwhile, Amazon is working to get its Alexa voice interface in a variety of products. The tech world is betting that voice will be the next big computer interface, and Amazon wants to keep its head start.